Editor’s note: As the Church of God movement nears its 135th year, more and more congregations have celebrated, or will soon celebrate, their centennial. We rejoice with each one as such milestones are reached, affirming generations of hard-working families and individuals, altogether representative of God’s faithfulness through the years. One local church that has reached its 125th year is First Church of God in Wauseon, Ohio. They recently held special festivities to commemorate and honor the Lord on this landmark occasion. In a society where things seem to come and go, the Wauseon First Church of God has been a constant in the lives of many local Fulton County citizens. On April 25 and 26, the church celebrated their 125 anniversary with a combination of celebrating the past and looking forward to the future. The Wauseon First Church of God is the oldest active Church of God, Anderson, Indiana-affiliated church in the state of Ohio. 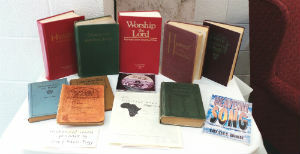 The church roots were planted in a grassroots-like formation in 1890 as men and women gathered in homes in the Ottokee area for Bible study and prayer. Their desire to gather together and start a Church of God movement in Wauseon, Ohio, has spanned generations and has impacted the lives of countless individuals in Wauseon and the surrounding communities. As more people began to join this first gathering of men and women of the church, a permanent structure was needed. In 1911, a church was constructed at the corner of Walnut and North Fulton Streets in Wauseon, the same site where the present day church remains. Throughout the 125 years, the church has experienced growth, building additions, annual week revivals, and musical celebrations featuring E.E. Byrum and Barney Warren, hymn writers; and Sandi Patty and the Gaithers, present-day Christian singers. At one time, the baptistery was located in the basement with a raised mirror that allowed those sitting in the first floor sanctuary to observe baptisms. Judy Warncke, who has attended the church her entire life, was baptized in this baptism with her mother. were missionaries from England. Pastor John Osborne became the minister of the church in 1929. During his twenty-nine years of service to First Church of God in Wauseon, he and his wife were extremely influential in the church’s growth and role within the community. During his tenure, a building committee was formed to upgrade and remodel the original 1911 structure. The floor was raised in the sanctuary, the basement was remodeled, and a new entrance, coat room, and nursery were created. Also, during his time in the pulpit, he discontinued the practice of men and women sitting on opposite sides of the sanctuary so that families could sit together. T he church, nicknamed the “Little Block Church” for the four-inch block frame structure used in 1929, has housed years of memories for the many people who have called the church their home. Judy recalls, “We met in the sanctuary to sing a chorus and celebrate birthdays. Then, we marched out to ‘Onward, Christian Soldiers’ to Sunday school class.” Jim Figy recalls first attending the church at the age of three with his grandmother. He will be eighty-seven this July, and continues to be a vital part of the congregation. On Saturday, April 25, a celebration banquet was held at the Hope Center Hall on the premises of Sara’s Garden. More than two hundred people attended the event, including those who presently attend, those who formerly attended, former ministers and missionaries, and others with a special connection to the church. A catered dinner was enjoyed along with special music by Pastor Paul Flores and Randy Schantz. Memories from both the old and young alike were shared as people conveyed the important role the church has played in their lives. Reverend Gary Patton, who pastored the church from 1980 to 1986, delivered an inspirational message of reflections on the past and dreams of the future. On Sunday, the morning worship service continued the celebration. 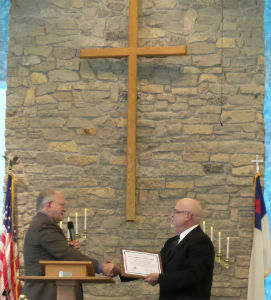 Dr. Randy Spence, director of ministries for Ohio Ministries of the Church of God, presented Pastor Paul Flores and the congregation with a plaque commemorating and honoring the church for their 125 years. He also shared that the average church from birth to death exists 100 years, and congratulated the church for not only making it beyond this, but also for also remaining a strong and vibrant congregation of both young and old alike. Pastor Paul Flores shared a message challenging his congregation that God will continue to use the church in Wauseon when people step out in faith. After a barbecue lunch, the Needhams, a musical quartet from Murfeesboro, Tennessee, closed out the day’s celebration with a musical blast of joy and praise. The church looks forward to its future, hopeful to continue to impact and influence the lives of local community members for 125 more years and beyond. This entry was posted in All Church of God, Great Lakes and tagged 125th anniversary, celebration, Centennial, First Church of God, heritage, history, Ohio, Paul Flores, Wauseon. Bookmark the permalink.